Click the button below to add the FINE Green Glow in the dark powder - Watch Airbrush to your wish list. 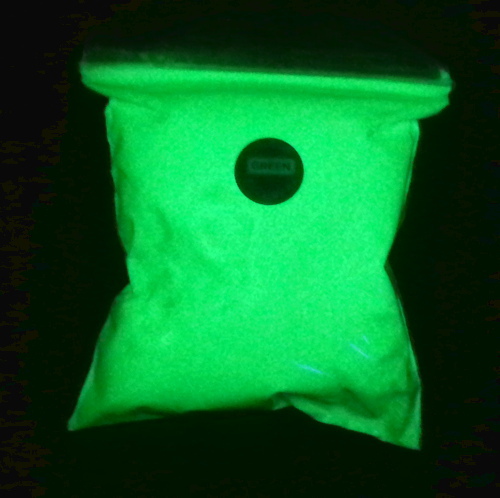 FINE Green Glow in the dark powder. Next generation Strontium Aluminate powder, providing faster charging times, better glow and longer lasting glow times. This is our extra fine particle size (10um) more suitable for use when watch re-luming or airbrush use. we also do a standard particle size more suitable for general use. Can be used for a wide range of craft and hobby applications. Mix and make your own paints, use as a dusting powder over glue, mix with resins or latex etc. It is non-toxic and non-radioactive. (not all glow pigments can be used in water based mediums. Our powder is specially coated to allow this). Commercial-strength photo-luminescent pigments. White with a slight tint of green in daylight, but will glow brilliantly in the dark after being charged by UV blacklight, daylight or even interior light bulbs. Glow in the dark green on steroids! I was looking for a way to add more of a punch to my glow in the dark pictures, and I found it! The powder is great and very bright. I have ordered more as it works so well. It works brilliantly whether you mix a little into your green paint or sprinkle over the top of a paint layer.